Located at the eastern end of the Meridian Building the Great Equatorial Building was erected as a separate building in 1858 to house the new 12.8-inch Merz Refractor. It now houses the 28-inch Refractor. 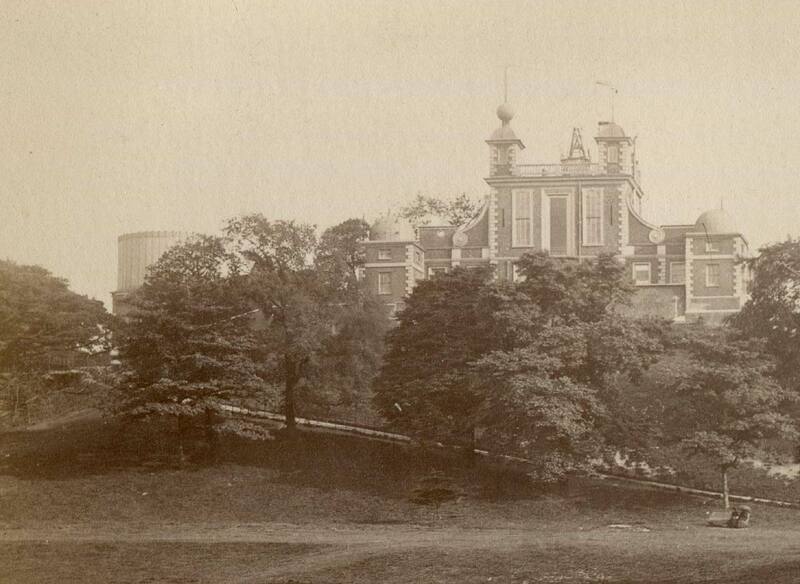 When first built, the building was known as the South-East Dome. 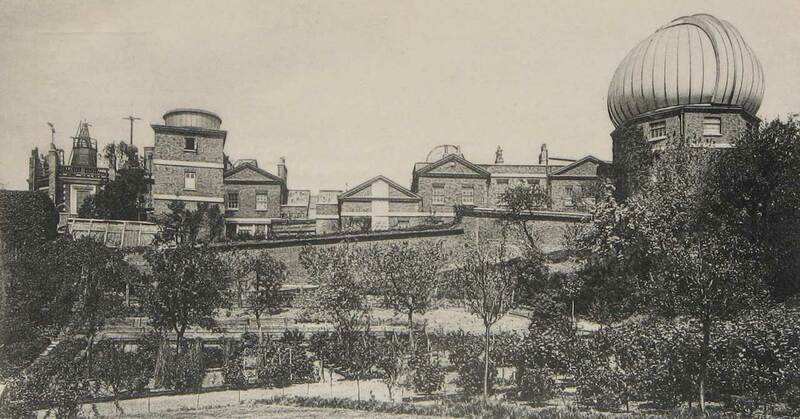 The drum dome, which originally surmounted it, was cylindrical in shape and turned on old canon balls. In 1861/2, as pressure on computing space mounted, some of the computing operations were moved to the first floor room below the telescope, the ground floor being used principally for the deposit of instruments. 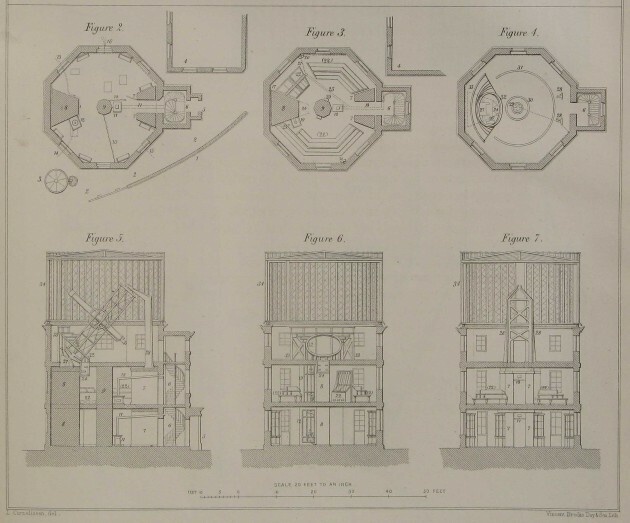 Because of the high monetary value of the chronometers being tested at the Observatory, it was decided that they needed to be in a fireproof room. As a result, there was a swap around in 1868. 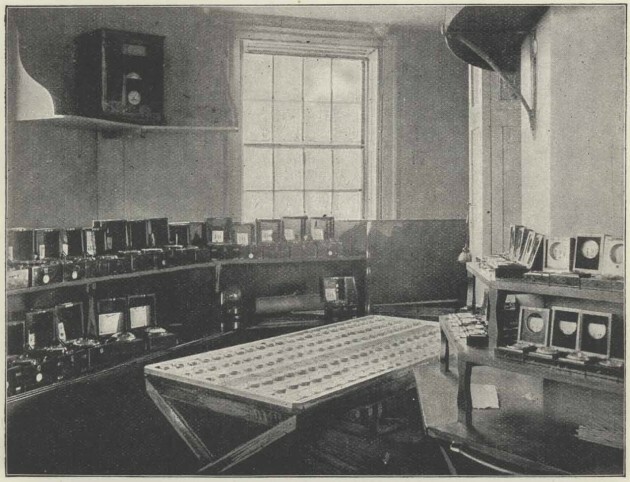 The chronometers were moved to the first floor of the South-East Dome and the room that they had occupied above the Principal Computing Room in the Meridian Building was converted into additional computing space. Amongst other things, the new chronometer room contained gas ovens in which the chronometers were heated. As part of the fireproofing of the building, the wooden staircase was replaced with the present one of iron and the wooden doors with the present ones which although they look like painted wood are actually solid iron. The wooden joists of the upper floors were replaced by girders and cross joists of wrought-iron, and the floorboards replaced by the present tiles. The ground floor was paved with flagstones, and a partition of corrugated iron erected to create a Chronometer Office. Click here for the accompanying key. 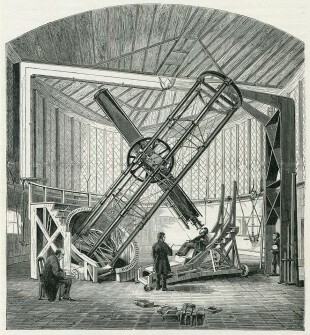 In 1886, Christie secured the necessary funding to allow him to replace the Merz refractor with a larger 28-inch one on the same mounting. 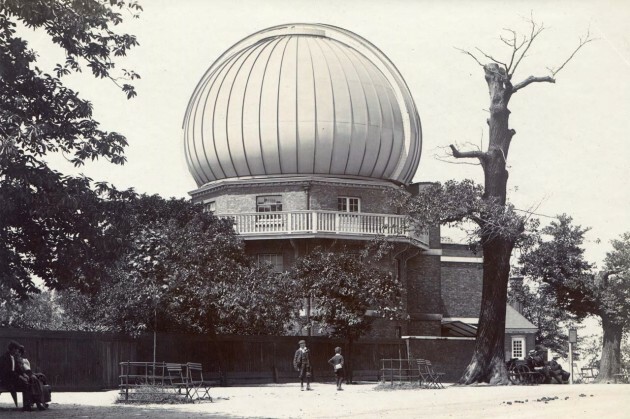 The proposed new telescope was about 3m longer than the old, and if Christie is to be believed, it was his intention to retain the old drum dome. 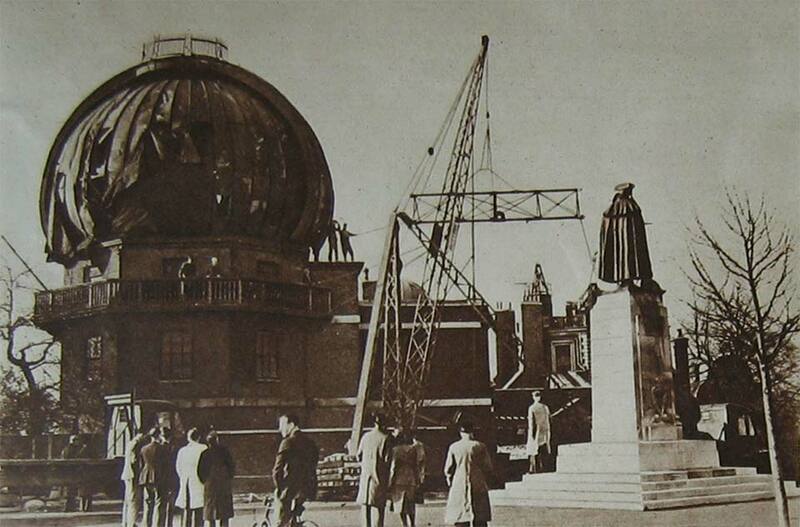 As works progressed it became apparent that because of structural damage the dome would have to be replaced. Christie came up with a rather elegant proposal for an onion shaped dome. 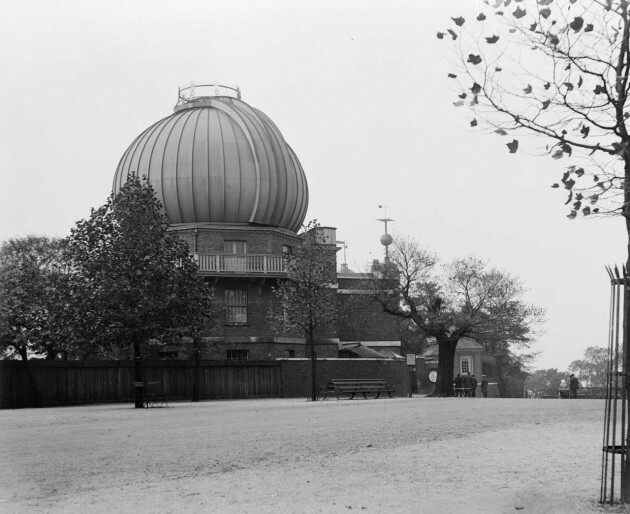 With a diameter at its widest point of 36 feet, the dome was 5 feet wider than the tower on which it stood. With an iron framework and clad in papier mâché, the dome was completed by Messrs T Cooke and Sons of York in April 1893, the old dome having been removed the previous November. Originally, there was no crown. 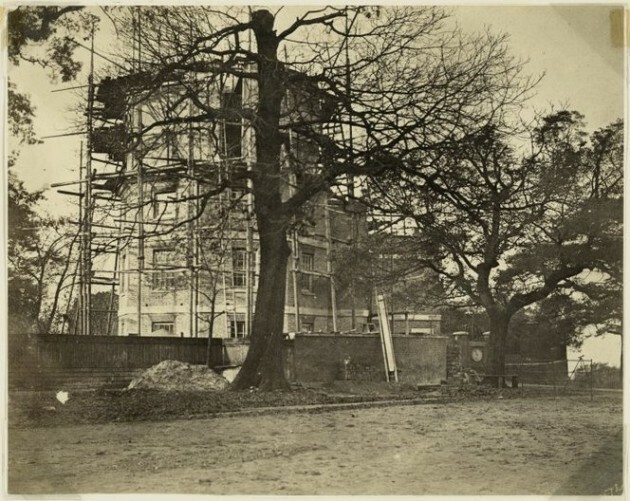 This was added in 1907/8 to facilitate working on the dome. Click here to read Christie’s description of the new dome, which was published in 1891 in Monthly Notices of the Royal Astronomical Society, Vol. 51, pp.436–38. 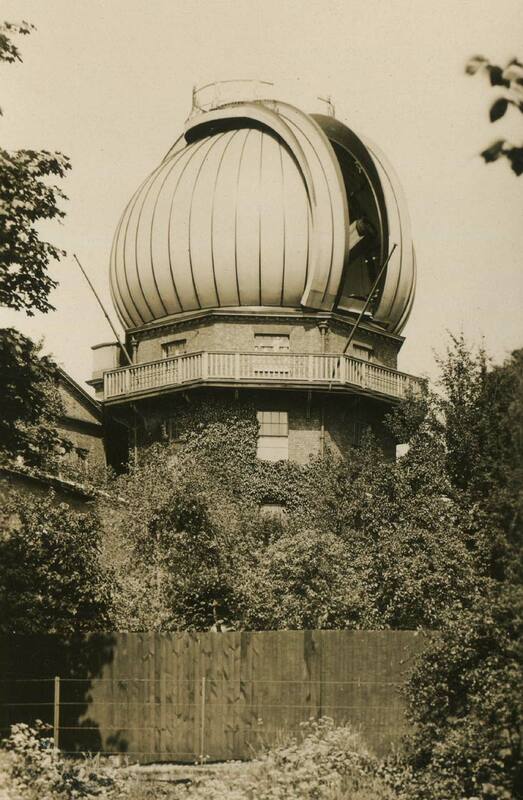 Even with the new wider dome, the telescope protruded through it at low altitudes. 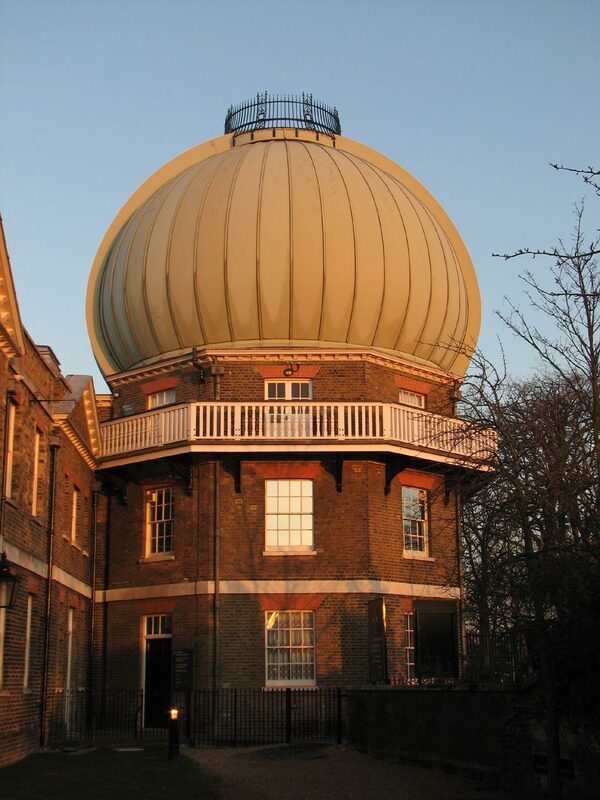 Things would have been more hazardous still when manipulating the dome and telescope if the smaller drum dome had been retained. It is difficult to decide if Christie knew all along that the dome would have to be replaced, but thought the project would not have been given the go ahead if this had been costed for at the start. 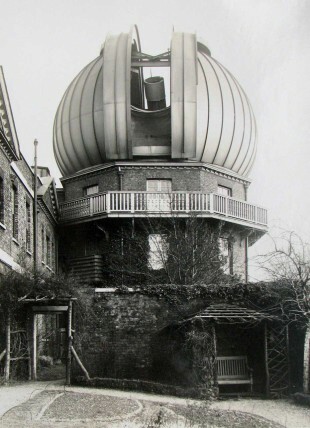 The balcony was added so that the observers could step out and get an all round view of the sky. Originally proposed in 1894, it was eventually completed in September 1898. At this time, the west side of the building was thickly covered in Ivy. Rather than take it all down, the ivy was cut through at the level of the proposed balcony leaving the upper branches to die for later removal. They were still present in 1901. Meanwhile, the water tank on the roof above the stairs was added in 1897 to provide a better supply to the water-clock that drove the telescope within. When the water-clock was replaced with an electrically driven one in 1929, the water tank was left in place. The water clock was removed in 1937/8 and the tank in 1946/7 to facilitate removal of the telescope to Herstmonceux. In 1937/8, the mechanisms used to both rotate and open the dome were replaced. The rail on which it turned then fractured in early 1939. 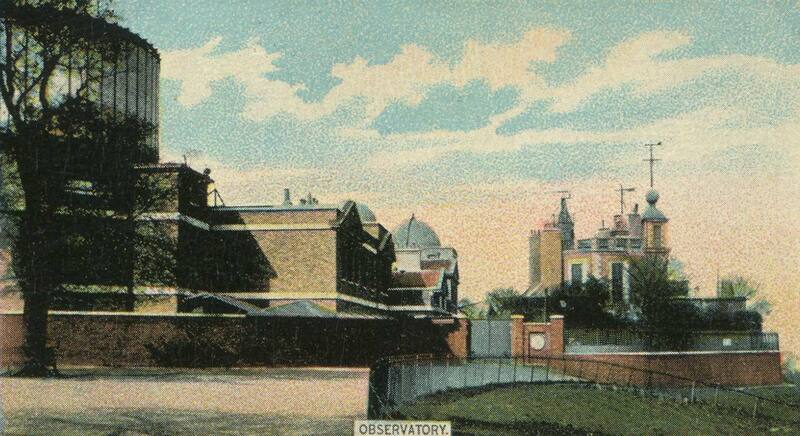 As it had been agreed that the Observatory would be moving to a new site, only temporary repairs were made. The dome was turned and parked in a position that would allow the observation of the best selection of stars without having to move it. With the outbreak of war, the objective lens of the telescope was dismounted on 1 September 1939 for safekeeping. Later in the war, the papier mâché covering was damaged by blasts nearby. The telescope was removed in December 1947 and taken into store at Herstmonceux prior to its later erection there. Although some parts were removed through the shutter opening, others were removed by breaching the brickwork on either side of the eastern doorway and removing it via the balcony. 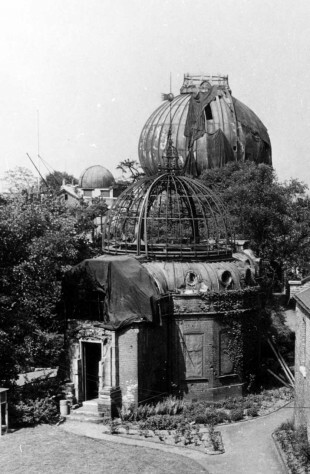 The dome was subsequently stripped of the remainder of its covering. On 19 January 1952 the Treasury authorised the use of the building as part of a Museum of Navigation and Astronomy under the charge of the National Maritime Museum (NMM). The Ministry of Works took over the building on 20 October 1952. They considered the skeletal framework to be both unsafe and an eyesore and regrettably it was removed in 1953 and the building capped with a flat roof. 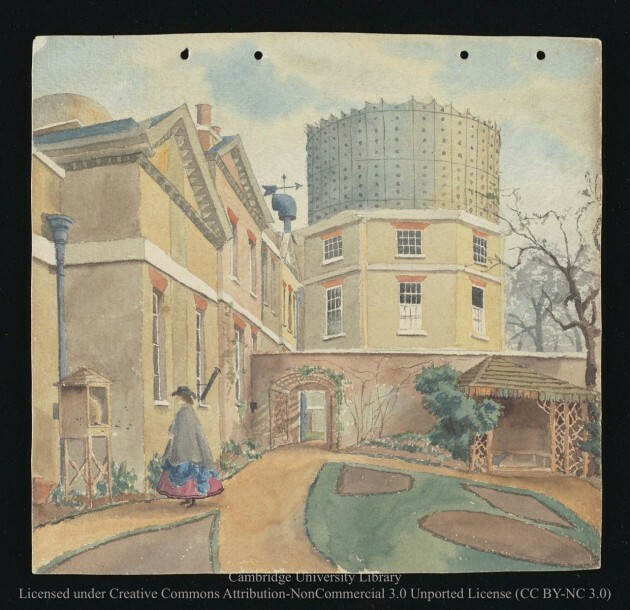 In 1954, plans were drawn up for the adaptation of the northern Observatory buildings for Museum use. 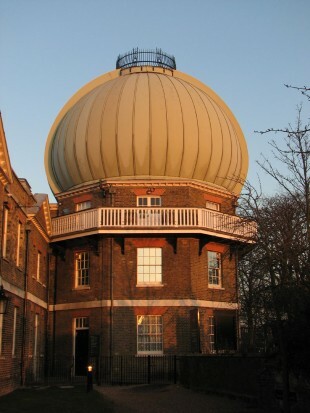 In the case of the Great Equatorial Building, this consisted on the addition of a second staircase – an external spiral staircase on the north-west side – and the construction of a concrete dome on a frame of steel rods and wire mesh in the shape of the former onion dome. Within the dome it was planned to place not a telescope, but a giant orrery showing the movement of the planets, the inside of the dome being painted with a representation of the night sky and marked up with the constellations. 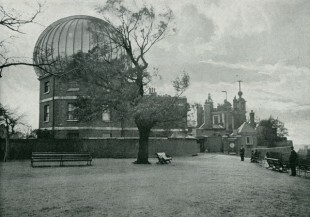 This plan was then abandoned in favour of installing a planetarium instead. 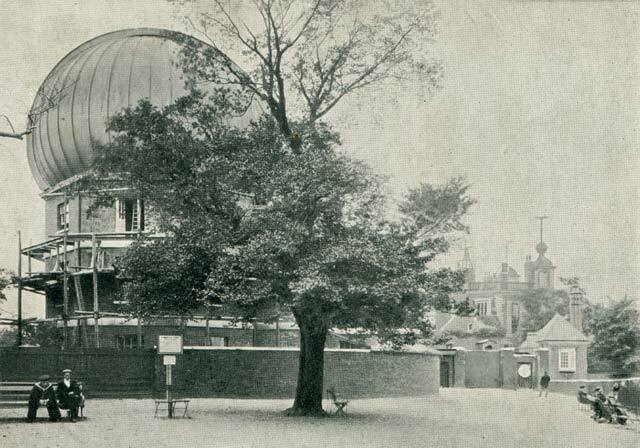 By 1961, the NMM had changed its mind again and proposed instead to install the Northumberland Telescope, from the Cambridge Observatory in the dome and a planetarium in the dome of the South Building. The arrival of the Northumberland telescope was contingent on a suitable replacement telescope being procured for the students at Cambridge. This never happened. By the start of the 1970s, the 28-inch telescope was no longer required at Herstmonceux and it was offered to the Museum who accepted it. 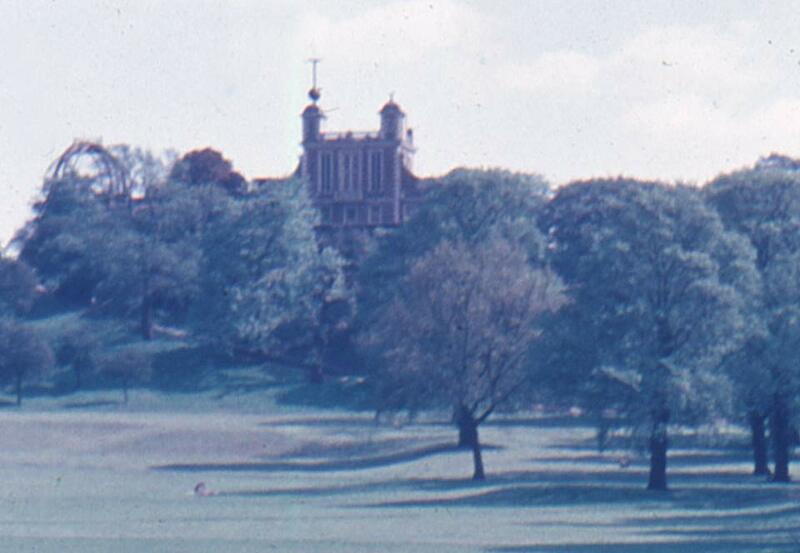 It was dismantled and re-erected at Greenwich in November 1971. 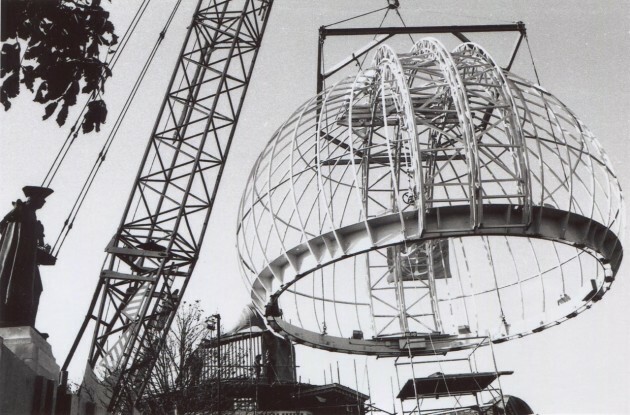 It was protected by a scaffolded covering until the arrival of a new dome. This was constructed along the lines of that designed by Christie, but with a double skinned fibreglass rather than a papier mâché covering. The new skeletal Dome was craned into place in October 1974, prior to the coverings being applied. It was officially reopened on 20 May 1975 by Her Majesty the Queen who visited the site with HRH The Duke of Edinburgh as part of the Observatory’s tercentenary celebrations. The building was given a Grade l listing on 8 June 1973. Initially the floors below the Dome were used by the Museum for its Shop and accompanying store. Roy Clare, Director of the National Maritime Museum from 2000–2007 was keen to increase the Museum’s income and moved the shop to a more prime location. This allowed the museum’s horology department to take over the middle floor as offices and for the ground floor to become a gallery devoted to chronometers and their care – an appropriate location given the previous history of testing that had been carried out in the building. 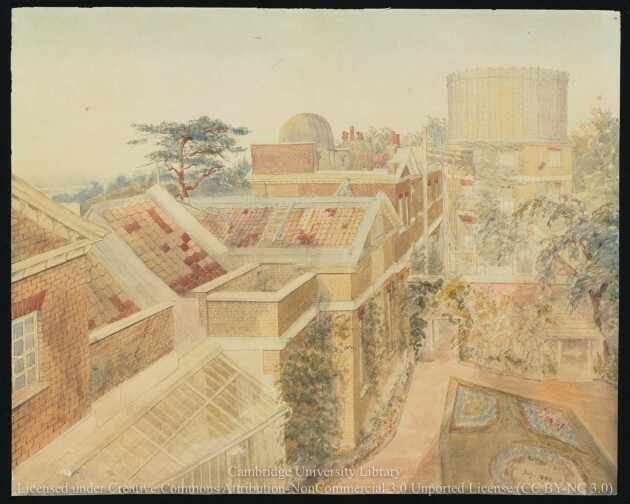 The images reproduced courtesy of Cambridge Digital Library have been reduced in size and are more compressed than the originals and have been reproduced under the terms of a Creative Commons Attribution-NonCommercial 3.0 Unported License. Links to the individual images are as follows: image 1, image 2.